NOT A SINGLE DOUBT (AUS) (Bay 2001-Stud 2005). 4 wins-3 at 2, AJC Canonbury S., L. Leading Aust. Sire of 3YOs 2015-16. Sire of 751 rnrs, 541 wnrs, 55 SW, inc. Miracles of Life (MRC Blue Diamond S., Gr.1), Extreme Choice, Secret Agenda, Scales of Justice, Single Gaze, Clearly Innocent, Mighty Boss, Good Project, Don't Doubt Mamma, Kenedna, Fell Swoop, Gypsy Diamond, Villa Verde, Not a Single Cent, Gunnison, Summer Sham, Into the Red, Payroll, etc. SOUTHERN LEGEND (g. by Not a Single Doubt). 8 wins from 1000m to 1600m, A$245,580, HK$6,724,400, to 2017-18, ATC Darby Munro S., L, HKJC Rapper Dragon H., ATC Sydney Markets Foundation H., Bowermans Office Furniture P., Mark Eaves H., HKJC Sweet Orange H., Flying Dancer H., Yip Fat H., 2d HKJC Beijing H., 3d ATC Theo Marks S., Gr.2, VRC Tab.com.au S., Gr.2, 4th HKJC Stewards' Cup, Gr.1. Treviso (g. by Snitzel). 2 wins-1 at 2-at 1000m to 2016-17, 3d ATC Can Assist Volunteers 2YO P.
Appello (f. by Testa Rossa). 3 wins at 1450m, 1600m in Aust. Maxima (f. by Choisir). Placed at 2 in 2016-17 in Aust. Don Carmello. 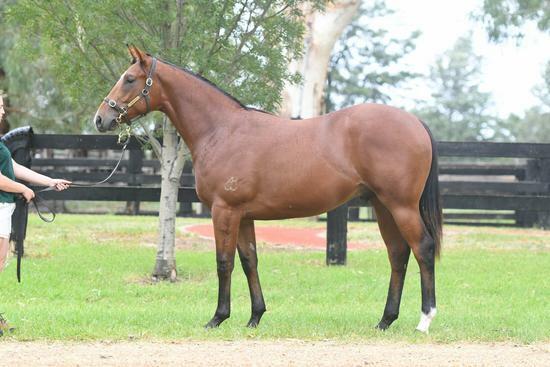 3 wins-1 at 2-from 1250m to 2000m, STC Book Now for Gold Slipper Festival 2YO H.
Donna's Appeal. 3 wins. See above. Chastelain. 4 wins from 1300m to 1650m, A$85,947, 3d AJC Rosebery H., BRC Precision Tailors H., MVRC Legends After the Last P., 4th STC Todman S., Gr.2. DONNA NATALIA (Anabaa). Winner. See above. Disney Dollars. 4 wins to 1400m, A$86,735, AJC Macau Jockey Club Goodwill Trophy H., STC Hahn Premium Light H., 2d STC Clan O'Sullivan 2YO H., Final Furlong Promotion 2YO H., 3d STC Rene Rivkin Report 2YO H., AJC Spring Carnival H., 4th AJC Carbine Club S., L.
CHARGE FORWARD (Red Ransom). 4 wins-2 at 2-to 1200m, A$1,232,985, AJC Galaxy H., Gr.1, San Domenico S., Gr.2, STC Todman Slipper Trial S., Gr.2, AJC Breeders' P., L, 2d STC Golden Slipper S., Gr.1, NSW Tatt's RC Roman Consul S., Gr.3, 3d AJC Challenge S., Gr.2, Kindergarten S., Gr.3. Successful sire. MARSKIN (Marscay). 3 wins. See above. KIDMAN'S COVE (Marscay). 16 wins-3 at 2-from 1000m to 1600m, A$722,763, AJC Apollo S., Gr.2, Expressway S., Gr.2, STC Canterbury S., Gr.2, Gosford Guineas, L, STC Itchy Feet H., 2d STC Phar Lap S., Gr.2, Ajax S., Gr.3, 3d STC Skyline S., Gr.3. MONTAUK (More Than Ready). 6 wins from 1400m to 2000m, A$505,940, to 2017-18, ATC Summer Cup, Gr.3, City Tatt's RC Spring H., 2d ATC Winter Cup, L, 3d ATC Cup, L.
Lord Dane (Danehill). Winner at 1000m, A$119,600, 2d STC Todman Slipper Trial S., Gr.2, VATC Blue Diamond Prelude (c&g), Gr.3, 3d VRC Maribyrnong Trial S., L. Sire. GEORGETTE SILK (Flying Spur). Winner at 2, A$86,400, AJC Widden S., L, 3d AJC Kindergarten S., Gr.3. PEPPERWOOD (Easy Rocking). 11 wins-1 at 2-from 1200m to 1800m, A$1,050,021, BTC Doomben Classic, Gr.3, BRC Spear Chief H., L, Coffs Harbour Cup-twice, 3d Queensland Guineas, Gr.2.